Brown Bag Company – Durable, Low-cost Plan Bags & Blueprint Mailing Bags – Since 1974. Durable, low-cost Plan Bags & Blueprint Mailing Bags – since 1974. Our blueprint bags are the best in the business. 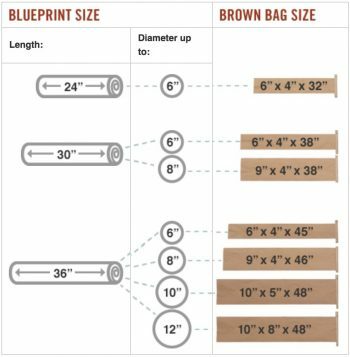 Use our handy sizing chart below, or call 1-866-737-1593 to speak live with a blueprint mailing bag expert. We’ll be happy to help you determine the right plan bag size for your needs. If you’d like, we can even send you a few free sample sizes. Bag sizes are measured as width of opening x height of opening x length of bag. (Example: 6″ wide x 4″ high x 32″ long). Below is our line of blueprint mailing bags / plan bags. You can order any quantity – including multiple sizes. Prices are based on a minimum quantity of 100 bags. For quantities less than 100, simply add $0.25 to each bag. Orders are processed within 24 hours and shipped using UPS Ground. Need it quicker? We’re happy to accommodate rush orders and alternative shipping methods. Just give us a call at 1-866-737-1593 and let us know. We do not require payment in advance. First-time customers will be contacted by phone to verify order and set-up billing account; established customers will receive an invoice after order has shipped. Invoices can be paid by check or credit card (Visa, MasterCard or American Express). We also accept faxed orders. Just fax your order details and contact information to 1-904-737-1579. We value your privacy and take information security very seriously. The information that we collect from you will only be used for processing your order. It will never be given to a third party. While larger suppliers must oversee thousands of different products, we’re able to concentrate on one — blueprint shipping and mailing bags. And that’s the way it’s been for almost 45 years. We’re relentlessly committed to providing you great savings and a memorable shopping experience. That’s why we guarantee the lowest prices and unconditional satisfaction — or your money back, no questions asked. Our bags are carefully constructed using two layers of heavy-duty American natural kraft paper. The layers are sewn together on the closed end of the bag, and the open end can be fastened shut with staples or tape. Paper bags are biodegradable, nontoxic and made from natural, renewable resources. Plastic bags are made from synthetic, toxic chemicals that cause cancer — and take a thousand years to degrade. It’s a no-brainer. In addition to costing almost 75% less than mailing tubes, paper blueprint mailing bags are cheaper to mail and easier to store. Our bags can be stacked flat and divided into piles; bulky mailing tubes present difficult storage challenges. To help reduce paper cuts, our bags feature a sawtooth-shaped trim. The softer edge reduces shear on the bag’s open end. We call it “cutting-edge technology”. The Brown Bag Company was created in 1974 to help fulfill the growing needs of architects, designers, engineers, contractors, subcontractors, craftsmen, city planners, office administrators, delivery personnel and other professionals whose businesses depend on the safe and secure transport of blueprints, plans, drawings and other rolled documents. We are headquartered in one of the country’s biggest transportation, logistics and shipping hubs — Jacksonville, Florida — and can ship orders to anywhere in the world. Provide high-quality, American-made blueprint mailing bags at the lowest prices in the business—and guarantee complete and unconditional customer satisfaction with every order. For more information about our line of blueprint shipping bags, please contact Brown Bag Company president, Jim Russell at 1-866-737-1593.